A satellite navigation or satnav system is a system that uses satellites to provide autonomous geo-spatial positioning. It allows small electronic receivers to determine their location (longitude, latitude, and altitude/elevation) to high precision (within a few metres) using time signals transmitted along a line of sight by radio from satellites. The system can be used for providing position, navigation or for tracking the position of something fitted with a receiver (satellite tracking). The signals also allow the electronic receiver to calculate the current local time to high precision, which allows time synchronisation. Satnav systems operate independently of any telephonic or internet reception, though these technologies can enhance the usefulness of the positioning information generated. A satellite navigation system with global coverage may be termed a global navigation satellite system (GNSS). As of October 2018[update], the United States' Global Positioning System (GPS) and Russia's GLONASS are fully operational GNSSs, with China's BeiDou Navigation Satellite System (BDS) and the European Union's Galileo scheduled to be fully operational by 2020. India, France and Japan are in the process of developing regional navigation and augmentation systems as well. Global coverage for each system is generally achieved by a satellite constellation of 18–30 medium Earth orbit (MEO) satellites spread between several orbital planes. The actual systems vary, but use orbital inclinations of >50° and orbital periods of roughly twelve hours (at an altitude of about 20,000 kilometres or 12,000 miles). GNSS-1 is the first generation system and is the combination of existing satellite navigation systems (GPS and GLONASS), with Satellite Based Augmentation Systems (SBAS) or Ground Based Augmentation Systems (GBAS). In the United States, the satellite based component is the Wide Area Augmentation System (WAAS), in Europe it is the European Geostationary Navigation Overlay Service (EGNOS), and in Japan it is the Multi-Functional Satellite Augmentation System (MSAS). Ground based augmentation is provided by systems like the Local Area Augmentation System (LAAS). GNSS-2 is the second generation of systems that independently provides a full civilian satellite navigation system, exemplified by the European Galileo positioning system. These systems will provide the accuracy and integrity monitoring necessary for civil navigation; including aircraft. Initially, this system consisted of only Upper L-Band frequency sets (L1 for GPS, E1 for Galileo, G1 for GLONASS). In recent years, GNSS systems have begun activating Lower L-Band frequency sets (L2 and L5 for GPS, E5a and E5b for Galileo, G3 for GLONASS) for civilian use; they feature higher aggregate accuracy and fewer problems with signal reflection. As of late 2018, a few consumer grade GNSS devices are being sold that leverage both, and are typically called "Dual band GNSS" or "Dual band GPS" devices. Core Satellite navigation systems, currently GPS (United States), GLONASS (Russian Federation), Galileo (European Union) and Compass (China). Global Satellite Based Augmentation Systems (SBAS) such as Omnistar and StarFire. Regional SBAS including WAAS (US), EGNOS (EU), MSAS (Japan) and GAGAN (India). Regional Satellite Navigation Systems such as China's Beidou, India's NAVIC, and Japan's proposed QZSS. Continental scale Ground Based Augmentation Systems (GBAS) for example the Australian GRAS and the joint US Coast Guard, Canadian Coast Guard, US Army Corps of Engineers and US Department of Transportation National Differential GPS (DGPS) service. Regional scale GBAS such as CORS networks. Local GBAS typified by a single GPS reference station operating Real Time Kinematic (RTK) corrections. Ground based radio navigation has long been practiced. The DECCA, LORAN, GEE and Omega systems used terrestrial longwave radio transmitters which broadcast a radio pulse from a known "master" location, followed by a pulse repeated from a number of "slave" stations. The delay between the reception of the master signal and the slave signals allowed the receiver to deduce the distance to each of the slaves, providing a fix. The first satellite navigation system was Transit, a system deployed by the US military in the 1960s. Transit's operation was based on the Doppler effect: the satellites travelled on well-known paths and broadcast their signals on a well-known radio frequency. The received frequency will differ slightly from the broadcast frequency because of the movement of the satellite with respect to the receiver. By monitoring this frequency shift over a short time interval, the receiver can determine its location to one side or the other of the satellite, and several such measurements combined with a precise knowledge of the satellite's orbit can fix a particular position. Satellite orbital position errors are induced by variations in the gravity field and radar refraction, among others. These were resolved by a team led by Harold L Jury of Pan Am Aerospace Division in Florida from 1970-1973. Using real-time data assimilation and recursive estimation, the systematic and residual errors were narrowed down to a manageable level to permit accurate navigation. Part of an orbiting satellite's broadcast included its precise orbital data. In order to ensure accuracy, the US Naval Observatory (USNO) continuously observed the precise orbits of these satellites. As a satellite's orbit deviated, the USNO would send the updated information to the satellite. Subsequent broadcasts from an updated satellite would contain its most recent ephemeris. Modern systems are more direct. The satellite broadcasts a signal that contains orbital data (from which the position of the satellite can be calculated) and the precise time the signal was transmitted. The orbital ephemeris is transmitted in a data message that is superimposed on a code that serves as a timing reference. The satellite uses an atomic clock to maintain synchronization of all the satellites in the constellation. The receiver compares the time of broadcast encoded in the transmission of three (at sea level) or four different satellites, thereby measuring the time-of-flight to each satellite. Several such measurements can be made at the same time to different satellites, allowing a continual fix to be generated in real time using an adapted version of trilateration: see GNSS positioning calculation for details. Each distance measurement, regardless of the system being used, places the receiver on a spherical shell at the measured distance from the broadcaster. By taking several such measurements and then looking for a point where they meet, a fix is generated. However, in the case of fast-moving receivers, the position of the signal moves as signals are received from several satellites. In addition, the radio signals slow slightly as they pass through the ionosphere, and this slowing varies with the receiver's angle to the satellite, because that changes the distance through the ionosphere. The basic computation thus attempts to find the shortest directed line tangent to four oblate spherical shells centred on four satellites. Satellite navigation receivers reduce errors by using combinations of signals from multiple satellites and multiple correlators, and then using techniques such as Kalman filtering to combine the noisy, partial, and constantly changing data into a single estimate for position, time, and velocity. The original motivation for satellite navigation was for military applications. Satellite navigation allows precision in the delivery of weapons to targets, greatly increasing their lethality whilst reducing inadvertent casualties from mis-directed weapons. (See Guided bomb). Satellite navigation also allows forces to be directed and to locate themselves more easily, reducing the fog of war. The ability to supply satellite navigation signals is also the ability to deny their availability. The operator of a satellite navigation system potentially has the ability to degrade or eliminate satellite navigation services over any territory it desires. The United States' Global Positioning System (GPS) consists of up to 32 medium Earth orbit satellites in six different orbital planes, with the exact number of satellites varying as older satellites are retired and replaced. Operational since 1978 and globally available since 1994, GPS is the world's most utilized satellite navigation system. The formerly Soviet, and now Russian, Global'naya Navigatsionnaya Sputnikovaya Sistema, (GLObal NAvigation Satellite System or GLONASS), is a space-based satellite navigation system that provides a civilian radionavigation-satellite service and is also used by the Russian Aerospace Defence Forces. GLONASS has full global coverage with 24 satellites. The European Union and European Space Agency agreed in March 2002 to introduce their own alternative to GPS, called the Galileo positioning system. Galileo became operational on 15 December 2016 (global Early Operational Capability (EOC))  At an estimated cost of €3 billion, the system of 30 MEO satellites was originally scheduled to be operational in 2010. The original year to become operational was 2014. The first experimental satellite was launched on 28 December 2005. Galileo is expected to be compatible with the modernized GPS system. The receivers will be able to combine the signals from both Galileo and GPS satellites to greatly increase the accuracy. Galileo is expected to be in full service in 2020 and at a substantially higher cost. The main modulation used in Galileo Open Service signal is the Composite Binary Offset Carrier (CBOC) modulation. China has indicated their plan to complete the entire second generation Beidou Navigation Satellite System (BDS or BeiDou-2, formerly known as COMPASS), by expanding current regional (Asia-Pacific) service into global coverage by 2020. 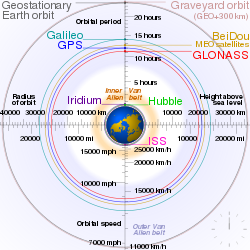 The BeiDou-2 system is proposed to consist of 30 MEO satellites and five geostationary satellites. A 16-satellite regional version (covering Asia and Pacific area) was completed by December 2012. Chinese regional (Asia-Pacific, 16 satellites) network to be expanded into the whole BeiDou-2 global system which consists of all 35 satellites by 2020. The NAVIC or NAVigation with Indian Constellation is an autonomous regional satellite navigation system developed by Indian Space Research Organisation (ISRO) which would be under the total control of Indian government. The government approved the project in May 2006, with the intention of the system completed and implemented on 28 April 2016. It will consist of a constellation of 7 navigational satellites. 3 of the satellites will be placed in the Geostationary orbit (GEO) and the remaining 4 in the Geosynchronous orbit(GSO) to have a larger signal footprint and lower number of satellites to map the region. It is intended to provide an all-weather absolute position accuracy of better than 7.6 meters throughout India and within a region extending approximately 1,500 km around it. A goal of complete Indian control has been stated, with the space segment, ground segment and user receivers all being built in India. All seven satellites, IRNSS-1A, IRNSS-1B, IRNSS-1C, IRNSS-1D, IRNSS-1E, IRNSS-1F, and IRNSS-1G, of the proposed constellation were precisely launched on 1 July 2013, 4 April 2014, 16 October 2014, 28 March 2015, 20 January 2016, 10 March 2016 and 28 April 2016 respectively from Satish Dhawan Space Centre. The system is expected to be fully operational by August 2016. The Quasi-Zenith Satellite System (QZSS) is a proposed four-satellite regional time transfer system and enhancement for GPS covering Japan and the Asia-Oceania regions. QZSS services are available on a trial basis as of January 12, 2018, and are scheduled to be launched in November 2018. The first satellite was launched in September 2010. GNSS augmentation is a method of improving a navigation system's attributes, such as accuracy, reliability, and availability, through the integration of external information into the calculation process, for example, the Wide Area Augmentation System, the European Geostationary Navigation Overlay Service, the Multi-functional Satellite Augmentation System, Differential GPS, GPS-aided GEO augmented navigation (GAGAN) and inertial navigation systems. Doppler Orbitography and Radio-positioning Integrated by Satellite (DORIS) is a French precision navigation system. Unlike other GNSS systems, it is based on static emitting stations around the world, the receivers being on satellites, in order to precisely determine their orbital position. The system may be used also for mobile receivers on land with more limited usage and coverage. Used with traditional GNSS systems, it pushes the accuracy of positions to centimetric precision (and to millimetric precision for altimetric application and also allows monitoring very tiny seasonal changes of Earth rotation and deformations), in order to build a much more precise geodesic reference system. The two current operational low Earth orbit satellite phone networks are able to track transceiver units with accuracy of a few kilometers using doppler shift calculations from the satellite. The coordinates are sent back to the transceiver unit where they can be read using AT commands or a graphical user interface. This can also be used by the gateway to enforce restrictions on geographically bound calling plans. ^ Orbital periods and speeds are calculated using the relations 4π²R³ = T²GM and V²R = GM, where R = radius of orbit in metres, T = orbital period in seconds, V = orbital speed in m/s, G = gravitational constant ≈ 6.673×10−11 Nm²/kg², M = mass of Earth ≈ 5.98×1024 kg. ^ Approximately 8.6 times (in radius and length) when the moon is nearest (363 104 km ÷ 42 164 km) to 9.6 times when the moon is farthest (405 696 km ÷ 42 164 km). ^ a b "Beidou satellite navigation system to cover whole world in 2020". Eng.chinamil.com.cn. Retrieved 2011-12-30. ^ a b "Galileo goes live!". europa.eu. 2016-12-14. ^ "A Beginner's Guide to GNSS in Europe" (PDF). IFATCA. Retrieved 20 May 2015. ^ "Galileo General Introduction - Navipedia". gssc.esa.int. Retrieved 2018-11-17. ^ a b "GNSS signal - Navipedia". gssc.esa.int. Retrieved 2018-11-17. ^ Jury, H, 1973, Application of the Kalman Filter to Real-time Navigation using Synchronous Satellites, Proceedings of the 10th International Symposium on Space Technology and Science, Tokyo, 945-952. ^ "Galileo goes live!". europa.eu. 14 December 2016. ^ "Boost to Galileo sat-nav system". BBC News. 25 August 2006. Retrieved 2008-06-10. ^ "Commission awards major contracts to make Galileo operational early 2014". 2010-01-07. Retrieved 2010-04-19. ^ "GIOVE-A launch News". 2005-12-28. Retrieved 2015-01-16. ^ "India to develop its own version of GPS". Rediff.com. Retrieved 2011-12-30. ^ S. Anandan (2010-04-10). "Launch of first satellite for Indian Regional Navigation Satellite system next year". Beta.thehindu.com. Retrieved 2011-12-30. ^ "India to build a constellation of 7 navigation satellites by 2012". Livemint.com. 2007-09-05. Retrieved 2011-12-30. ^ "ISRO: All 7 IRNSS Satellites in Orbit by March". gpsworld.com. 2015-10-08. Retrieved 2015-11-12. ^ Laiqh A. Khan (May 24, 2016). "NAVIC could be operationalised during July–August this year". The Hindu. Retrieved September 2, 2017. ^ "JAXA Quasi-Zenith Satellite System". JAXA. Archived from the original on 2009-03-14. Retrieved 2009-02-22. ^ "Information and Analysis Center for Positioning, Navigation and Timing". ^ "GPS Space Segment". Retrieved 2015-07-24. ^ "DORIS information page". Jason.oceanobs.com. Retrieved 2011-12-30. ^ "Globalstar GSP-1700 manual" (PDF). Retrieved 2011-12-30. GPS and GLONASS Simulation (Java applet) Simulation and graphical depiction of the motion of space vehicles, including DOP computation. This page was last edited on 16 April 2019, at 01:45 (UTC).